In April, 1906, William Meese had plans for a new group picnic grounds on his property. 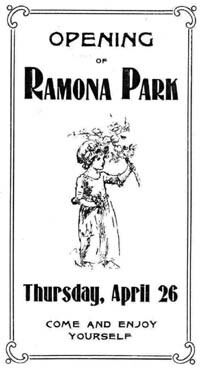 Called Ramona Park, it was located near today’s intersection of Greenbrook Drive and Camino Ramon. Picnic grounds like this were popular with fraternal and church orders throughout California and were often reachable by train. Picnickers were invited to the 10-acre park, which was “covered with wild maple, buckeye, elder and other California trees, and with a picturesque little lake ... ideal for swimming.” There was a fine dancing pavilion “whose floor no means have been spared to make perfect.” An article in the Danville Grange Herald indicated a ball ground, tennis court, cinder track for athletic events and a shooting range were planned. A brochure showing a sweet girl was produced for the April 26 opening. Notice the date on the Gazette article.That very day the Great Earthquake jolted San Francisco and the entire Bay Area. All thoughts of opening Ramona Park were put aside as residents cleaned up broken glass and checked the damage done to their chimneys. Soon the city’s fire sent refugees to the East Bay and illuminated the western sky. Support for the refugees was organized by the Grange, Rebekahs and Ramona Club. 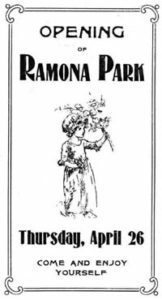 Not only was the park a source of income for the Meeses, it also introduced the beautiful San Ramon Valley to people from all over the Bay Area and was another project made possible by the presence of the railroad in the San Ramon Valley.